The prevalence of dementia in the United States is declining. But are all groups sharing in these gains? Earlier research found that there were large gaps in health between those living in urban versus rural areas, with the advantage going to urban dwellers. In a paper published recently in the American Journal of Preventive Medicine, SRC’s Ken Langa, with lead author Margaret Weden and co-authors Regina Shih from the RAND Corporation, and Mohammed Kabeto, used data from the Health and Retirement Study (HRS) to examine rural-urban gaps in cognitive health in a nationally representative sample for the first time. The HRS obtains information every two years on cognitive functioning that allows researchers to estimate the prevalence of dementia and what is known as cognitive impairment without dementia or CIND and changes over time. One way to look at urban-rural differences is to simply compare the rates of these health problems at two points in time. Langa and colleagues compared rural-urban differences in dementia and CIND in 2000 and then again in 2010. While both groups experienced declines in these problems, the declines were sharper for those living in rural areas, suggesting a narrowing of the rural-urban gap. The figure below shows that the prevalence of dementia in 2000 in urban areas was 5.4% in urban areas and 7.1% in rural areas. By 2010 those rates were 4.4% and 5.1% respectively. The pattern for CIND is similar. This is very good news. But the story doesn’t end there. The researchers examined changes in sociodemographic characteristics of those living in rural and urban areas over that same period. Two major changes happened between 2000 and 2010. First, educational levels changed substantially in rural areas. In rural areas, between 2000 and 2010, the proportion of older adults with less than 12 years of education dropped by about half. This reflects the rapid increase and spread of high school graduation between 1910 and 1940. Second, the racial/ethnic composition of these areas changed as well. In particular, non-Hispanic blacks and Hispanics were a larger proportion of the population of urban areas than rural areas in 2010 than 2000. 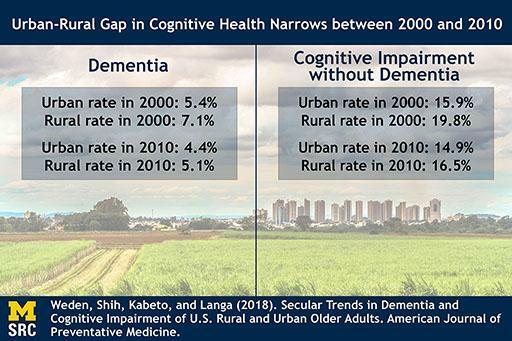 Interestingly, these changes account for much of the narrowing in the rural-urban gap in cognitive health. However, after taking into account sociodemographic and health factors there remained persisting rural disadvantages for dementia and CIND in 2000 and 2010. For example, the adjusted risk for dementia in 2010 was nearly 80% higher for rural compared to urban residents. Margaret M. Weden, Regina A. Shih, Mohammed U. Kabeto, Kenneth M. Langa (2018). Secular Trends in Dementia and Cognitive Impairment of U.S. Rural and Urban Older Adults. American Journal of Preventative Medicine, 54(2): 164-172.